The thyroid is a butterfly-shaped endocrine gland usually located in the lower front of the neck below the larynx (the voice box). The thyroid's job is to make thyroid hormones, which are secreted into the blood and then carried to every tissue in the body. Thyroid hormone helps the body use energy, stay warm and keep the brain, heart, muscles, and other organs working as they should. It also helps in regulating calcium level in blood. 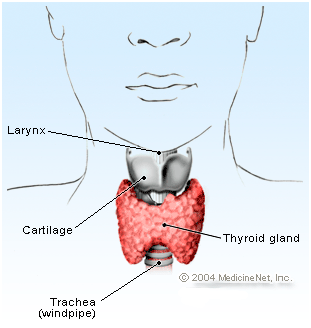 The main hormone made by the thyroid is thyroxine. Hypothyroidism is a kind of thyroid disease. If you have hypothyroidism that means you have an underactive thyroid. In people with hypothyroidism, the thyroid does not make enough thyroid hormone to keep the body running normally. Common causes of hypothyroidism are autoimmune disease, surgical removal of the thyroid, and radiation treatment. Hypothyroidism is more common in women than men; and, much more so in young women than young men. The risk of hypothyroidism increases during pregnancy, after delivery and around menopause. After a change in your thyroxine dose, you will need to have your TSH checked about every 6 to 10 weeks. You may need tests (FT4 levels) more often if you are pregnant or you are taking a medicine that interferes with your body's ability to use thyroxine (like calcium supplements, iron supplements, or antacids that contain either calcium or aluminum hydroxide). The goal of treatment for hypothyroidism is to get your TSH in the normal range and keep it there. Consequently, thyroxine and vitamin tablets should not be taken at same time and should be separated by 2-3 hours. Once you have established the thyroxine dose right for you, TSH tests are necessary about once a year. While regular exercise is important for most people, it is especially beneficial for people who have thyroid disorders. Early diagnosis and weight loss programs are also important for hypothyroid patients who are overweight. People who don't realize they have hypothyroid disease could risk gaining more and more weight over time. Eating healthy diet rich in vitamins, minerals and antioxidants is necessary. Keep yourself occupied with your job and perceive hobbies like reading, singing, painting etc. It also helps to have better approach towards life with disease. Take your pill at the same time every day - first thing in the morning or last thing at night works well for many people - and make it part of your daily routine. For many people, it is easy to forget whether they have taken their daily pill. To keep better track of your pills, store them in a container that has a box marked for each day of the week. Whatever container you use, keep it tightly closed so your pills stay dry. Store your pills in the room where you will best remember to take them. As with all medicines, keep thyroxine out of the reach of children. You can take your pill with any liquid except soy milk. Cow's milk is probably fine. Grapefruit juice and coffee should be avoided. Do not try to swallow your pill without liquid; if it dissolves in your mouth or throat, not enough medicine will be absorbed into your blood. It does not matter whether you take your pill on an empty stomach or with food, as long as you always do the same thing. That is because foods and medicines can interfere with the body's ability to absorb thyroxine. Wait 4 hours after taking thyroxine before you eat foods that contain soy (including soy formula for babies), take calcium supplements, iron supplements, or antacids that contain either calcium or aluminum hydroxide (see labels of antacid which you take). Take same brand of thyroxine always. To give thyroxine to a baby, crush the thyroxine pill between two spoons, mix it with a little water or breast milk, and immediately squirt it inside the baby's cheek with a medicine dropper. Then, nurse or bottle-feed the baby. Do not try to crush the thyroxine pill and mix it into in a bottle. Thyroxine loses its strength in liquid. It is not serious to miss just one pill because thyroxine stays in your blood for a long time. For example, if you remember this afternoon that you did not take your pill this morning, take it now. If today you remember that you did not take yesterday's pill, you can take two pills in one day - if possible, take one of the pills in the morning and the other one in the evening. If you are sick and vomit up a pill, do not take an extra pill. Wait and take your next regular dose tomorrow. However, if you vomit up a pill because you are pregnant and having morning sickness, take another pill at bedtime when you are less likely to feel sick. If you become pregnant, take your thyroxine dose as prescribed. Thyroxine is safe for women who are pregnant. In fact, if you are pregnant, you need thyroxine more than ever because it provides T4 for both yourself and your developing baby. Consult your doctor. Everyone should try to eat a balanced diet of nutritional foods from the basic food groups: fruits and vegetables, whole grains, low-fat dairy products, lean meats, beans, and essential fats. However, if you have thyroid problems, certain foods within those groups should be avoided. Two categories of foods have been associated with irregular thyroid hormone production and act as goitrogens. The first category is soybean-related foods. The second category is cruciferous vegetables including broccoli, cabbage, cauliflower, mustard green, red radish and turnips. Some other foods can also interfere with proper function of the thyroid gland. These foods include peaches, strawberries, peanuts, radishes, tofu, and spinach. These foods should NOT be included in your diet if you have thyroid disease. If you have hypothyroidism, you should also avoid iodine-containing foods including red food dyes, and iodine in dairy products, shellfish, multivitamins, and metabolic boosters.